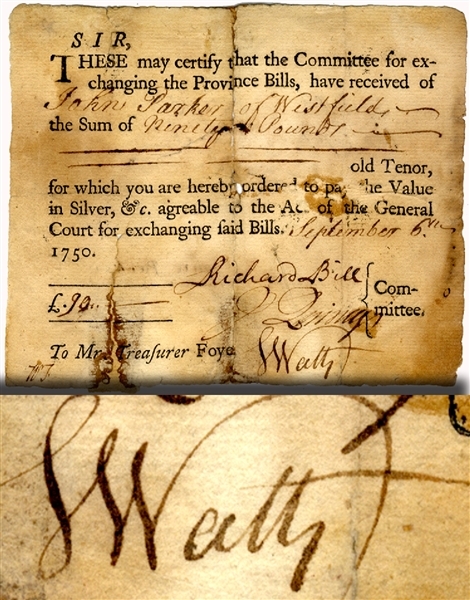 Document Signed, 5” x 4-1/4” exchange bill issued to John Parker, Westfield (MA), September 6, 1750 and signed by Committe members Samuel Watts, John Quincy and Richard Bill. Some “see thru” at folds. The first authorized lottery in Colonial America took place in Boston Massachusetts in 1745. The directors of the lottery were Samuel Watts, John Quincy, James Bowdoin, Robert Hale and Thomas Hutchinson.